Preliminary design plan for a large scout cruiser, called a "Battle Scout", prepared in response to a General Board request of 12 June 1915. This drawing originally was captioned as a Battle Cruiser but that title was erased and the title "Battle Scout" written in its place. No ships of this type were built but the hull structural design developed here and in P.D. 150 (see Photo # S-584-089) was adapted for the Constellation (Battle Cruiser # 1) class ships approved for construction later (see Photo # S-584-102). 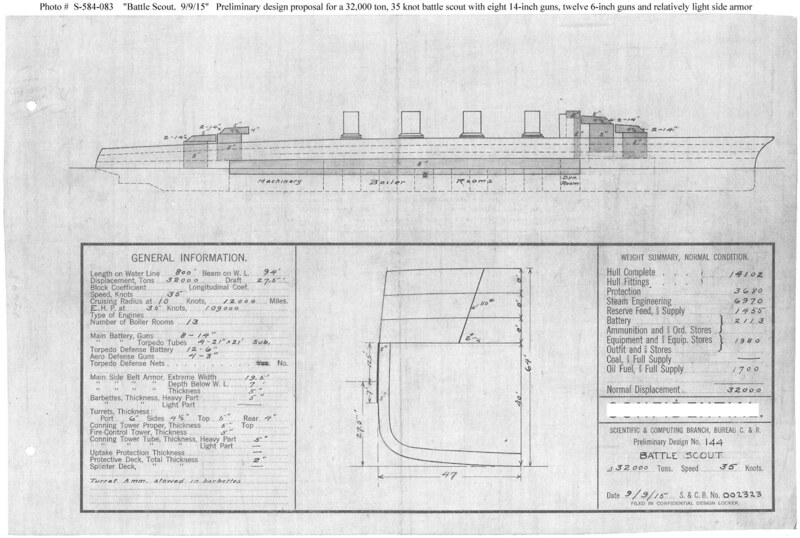 This plan provides eight 14-inch and twelve 6-inch guns, turbine machinery, and a speed of 35 knots in a ship 800 feet long on the water line, 94 feet.in beam, with a normal displacement of 32,000 tons. Note the lack of side armor in way of the turrets; their ammunition was to be stored in the armored barbettes.